Like all animals, your cat needs a diet that's properly balanced and contains all the required nutrients in correct quantities. These nutrients are water, protein, fats and oils, carbohydrate, minerals, and vitamins. Any manufactured pet food should provide your cat with this basic nutritional balance. The choice of serving canned or dry, or a mixture of the two, is really a matter of personal preference between you and your cat. While some cat owners swear by wet food, others insist that dry is the best. However, both sides have benefits and if feeding a 'complete' diet, they'll both deliver all the nutrients your cat needs in his daily diet. 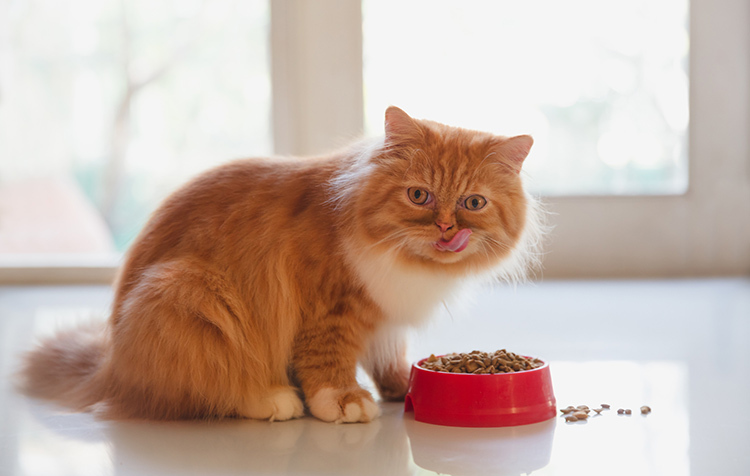 Recent developments in pet nutrition mean there is now a wide range of commercially produced cat foods designed to match more accurately your cat's specific needs. If your cat spends most of his time indoors, for example, he may benefit from a special indoor formula, while less-active cats require less fat, so feeding a 'light' formula could help to avoid weight gain. Do cats prefer dry food? 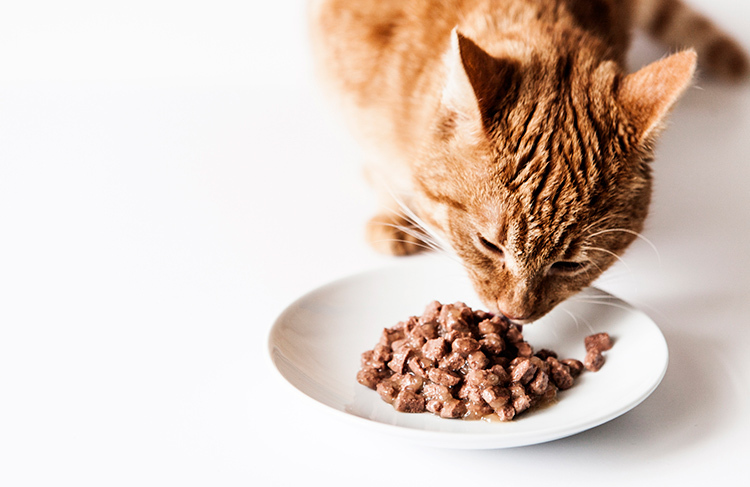 What are the benefits of dry cat food? Dry complete diets have some specific plus points - they are convenient, easy to measure and use, easier to store, and have a longer shelf-life once opened than wet foods. Some may also help to remove plaque from the teeth. Bear in mind that cats at certain life stages may prefer softer foods, for instance elderly cats or weaning kittens. Wet food will work well on these occasions and there are also some dry diets which have been specially designed to be soaked. Do cats prefer wet food? With wet foods cats tend to eat more in one sitting rather than going back and forth, and will drink less as there is higher water content in wet food than in dry food.. Serve the food at room temperature to ensure your cat can taste and smell it properly. Warming up an opened can may take up to two hours from being taken out of the fridge, microwaving canned foods for a short time is always an option, but ensure a consistent temperature throughout and be careful of hot spots. In general, avoid serving food for your cat that is either too hot or too cold. Don't keep wet food opened for longer than 24 hours as it will go off and cause upset tummies. Some cats simply prefer wet food's aroma and texture, and it can still be very convenient with single-serve formats ensuring a fresh, easy-to-serve meal each time. The amount of water intake is particularly important for cats prone to constipation or the formation of urinary crystals/stones, or if they have diabetes or kidney disease - therefore feeding a wet food can be especially beneficial for cats with these conditions. Should I mix up wet and dry cat food? When given a choice, many cats seem to prefer a mixture of both wet and dry foods compared to dry or wet only. Wet food is shown to increase enjoyment and add variety to a diet because of the wide selection of textures. On the other hand, dry food satisfies a cat's natural desire to eat many small meals throughout the day. 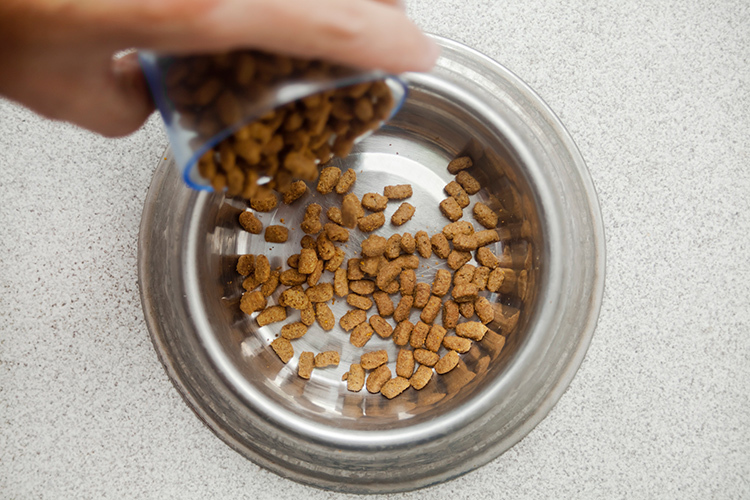 While dog owners tend to feed wet food as a topping, cat owners tend to feed either wet or dry separately. However, there are no hard and fast rules - ultimately it is for each owner to decide what to feed their pet. However, if feeding a mix of wet and dry pet foods, be careful to feed only the total amount of food that your pet needs so as to minimise any undesirable weight gain. Does my cat need to drink water as well? 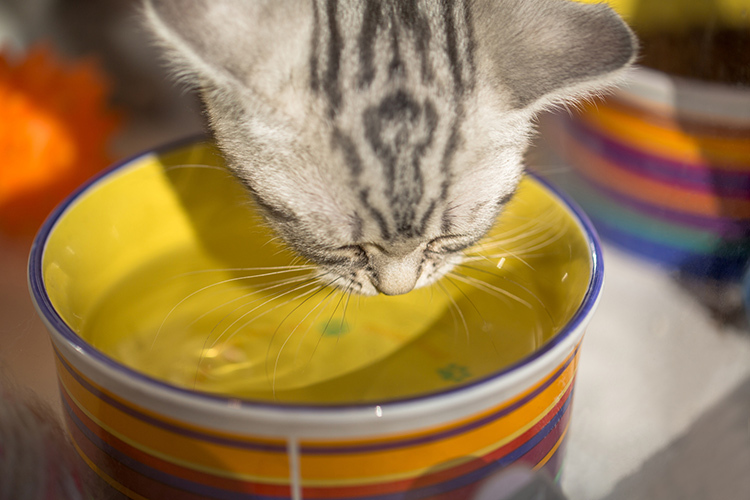 Whether your cat eats wet or dry food, it's imperative that your cat has access to clean, fresh drinking water at all times, preferably in a large ceramic bowl. Plenty of water is especially important if you are feeding dry food. If your cat is reluctant to drink, try a bigger bowl - some cats don't like it when their whiskers touch the sides - or a water fountain. Metallic bowls can put a cat off drinking too as they see reflections and shadows when they put their head down to drink. Ideally, water should not be positioned directly next to food as cats prefer some separation between their various resources. If cats go outdoors, a bowl to collect rainwater may be more popular than the clear, fresh water indoors. And remember, milk is not a substitute for water. Cats don't need milk after weaning and many are intolerant of lactose, which can cause diarrhoea. Even specially formulated 'cat milk' should be treated as a food, not a drink, with food intake adjusted accordingly. What type of cat food bowl is best? Stainless steel or ceramic bowls are usually preferred, as unlike plastic bowls, these are not likely to get scratched or worn. Bacteria is harboured in these scratches, and odours tend to sit in plastic bowls. Any plastic bowl that looks visibly scratched or worn should definitely be replaced, and all bowls - of any material - should be washed daily. Ensure you provide clean, fresh water in a large bowl, this will help to keep the kidneys healthy, and reduce the risk of Urinary infections. Cats usually favour shallow bowls so that their whiskers do not brush against the sides of the bowl, so this is definitely an important consideration to make when choosing a bowl. 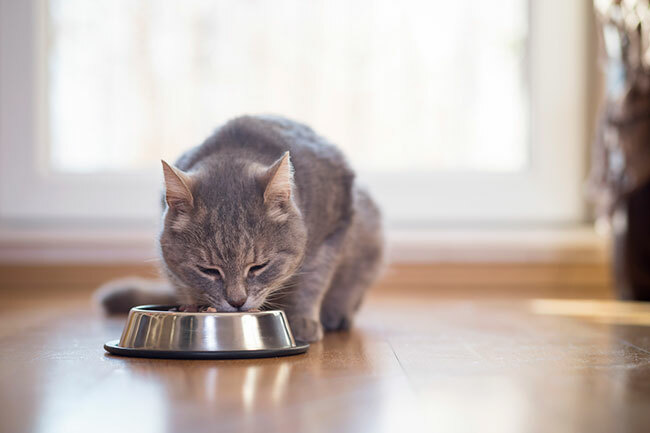 It's also crucial to bear in mind that separate bowls are usually preferable over 'double' bowls - cats dislike having their water next to their food bowl as it can become contaminated with bits of food. It is worth bearing in mind there are also cat feeders available which can be ideal for multi-cat households or for encouraging your cat's natural hunting instincts. Finally, where you choose to place your cat's bowl will make a huge difference to your cat. It's always a good idea to feed on a surface that is easily cleaned, like a tiled floor or a mat. If you have two cats, keep the bowls a reasonable distance apart to avoid confrontations or bullying. Put it somewhere you cat feels safe and secure, away from busy areas of the home and away from your cat's litter tray - cats are very clean creatures and won't eat near where they go to the toilet! Remember also that cats are confirmed meat eaters and cats will go blind, suffer other debilitating conditions, and ultimately die if fed on a vegetarian diet. Meat is the only major source of arachidonic acid, and cats lacking the ability to synthesize niacin from protein. Cats need meat to survive!